THE STORY BEHIND EVERY ALBUM sheds light on THE DOORS, rock’s wildest and most enigmatic band, with revealing and authoritative stories about the group’s hit recordings. This 98-page special goes deep into each of the group’s studio albums—from their groundbreaking debut recorded in 1966 to their final masterpiece, L.A. Woman– to reveal the stories behind their creation. One of the most revered and controversial groups in the entire classic rock pantheon, the reputation of The Doors and their legendary singer Jim Morrison reputation grows larger with every new generation. THE DOORS: THE STORY BEHIND EVERY ALBUM will take you on a journey through the fascinating details, creative epiphanies and backroom squabbles that shaped their legendary body of work that includes hits like “Light My Fire”, “People Are Strange” and “Love Her Madly”. 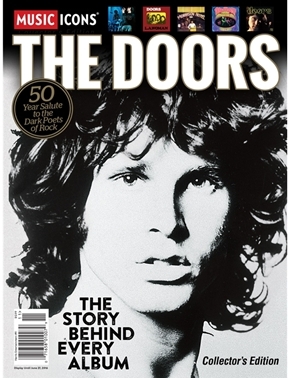 Morrison death in 1971 ended the band but the legend lives on in this handsomely packaged special.